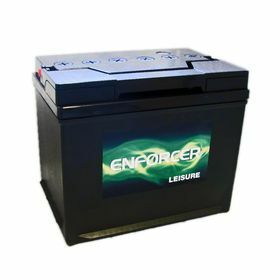 The Enforcer 12v 85Ah Leisure Batteryis a premium caravan battery. It is the most popular and best quality battery in leisure and caravan market today offering 85 Ah capacity. The Enforcer 12v 85Ah Leisure Battery is built and designed to use in all types of caravans, motorhomes and camping applications along with marine as well. The battery has 2-year warranty and is able to withstand the pressure of day to day use. This is a low maintenance battery which provides a low water loss design. This 85Ah battery for your caravan uses the latest deep cycle technology, meaning it can typically cycle to 50% charge and back, 120 times. If you want maximum power, reliability with longest durability at the best price and excellent value for money, then The Enforcer 12v 85Ah Leisure Batteryis the answer. Great service and an excellent range of batteries at competitive prices...my first stop for electric fencing batteries! Batteries fitted for my electric fence and its working absolutely fine providing great power and giving more cycles. Battery is perfect for use on electric fence. The enforcer battery is easy to maintain. Very helpful and quick service from County Battery. Ordered and arrived the same day . Battery is performing well on my camper van and is easy to maintain and charge.